Hot weather doesn’t mean you have to stop drinking tea. In fact, there’s sun tea, moon tea, iced tea, and all manner of summer-y ways to enjoy your favorite leaves. 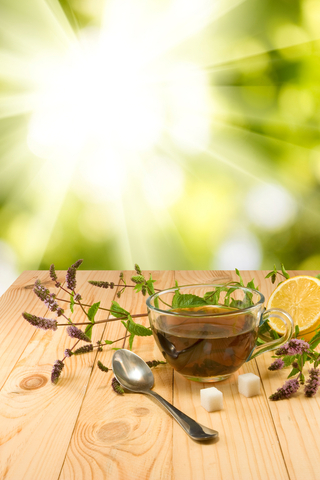 While a little bit of caffeine is okay (and even good for you) the summer sun and warmer nights are already disrupting sleep patterns, so switch to herbal in the afternoon. You can even make it a healthy herbal tea, like our heart supporting Jiaogulan. And make it fun: make tea taste more like summer by adding your own mix-ins, from dried, edible flowers, to flavored honey or dried fruit (keeping in mind the last two are adding in some sugar). Then pick how you want to brew it. If you’re facing down heat, iced tea can be quite refreshing. For a fast cup, just pour hot tea over lots of ice. For a slower, more flavorful brew, use more tea leaves, cold water, and leave in the fridge overnight (or from early morning for a sunset cup). If you want a traditional hot brew (great if you’re cutting through a sore throat, mucus from allergies or other respiratory problems) just follow the directions on the package—and remember that you can usually get two, three, sometimes four pots out of one batch of leaves. In summer, a hot cup of herbal tea on the patio during a cool night can be perfect. Even better about building up a tea habit: with the right pick, it can support your health. Lots of studies have tied a cup of tea (and its antioxidants, flavanoids, and more) to all sorts of health improvements, scraping the surface of what thousands of years of tea use already tells us! And it’s such an easy way to do something healthy, you don’t even have to leave your couch! For your next cup of tea, pick a healthy herbal like our Jiaogulan Tea of Life.